Simple changes in your sleeping posture can reduce the strain on your back. The healthiest position is sleeping on your side; draw your legs up slightly toward your chest. A pillow between the legs helps to keep your hip and low back in alignment. For back sleepers, placing a pillow beneath your knees reduces strain on the lower back. Sleeping on your stomach is generally the least spine-friendly; this position causes the back to go into extension and oftentimes, the head is turned to one side which places strain and compression on the neck. Sleeping without a head pillow keeps the neck in a more neutral position and placing a pillow under the lower abdomen/pelvis reduces low back strain. The best mattresses are designed to conform to the spine’s natural curves and keep the body in alignment. With so many different types of mattresses available on the market today (traditional spring, memory foam, adjustable air mattresses, waterbeds, etc) the most important thing to remember is that pricier is not always better; your comfort and level of support matter the most in deciding what type of bed to use. Remember to turn your mattress over every few months for even wear and replace after 5-7 years of regular use. Feeling uncomfortable trigger points, bumps, depressions and constant tossing and turning may be signs that it is time for a new mattress. Pillows come in even greater varieties of materials, shapes and sizes. Again, my same rule applies: pricier is not always better- your comfort and alignment will determine the proper type that’s right for you. A healthy pillow keeps your neck and upper back in natural alignment. I have my patients lay on their pillow at home in their typical sleeping position and have somebody take a picture. 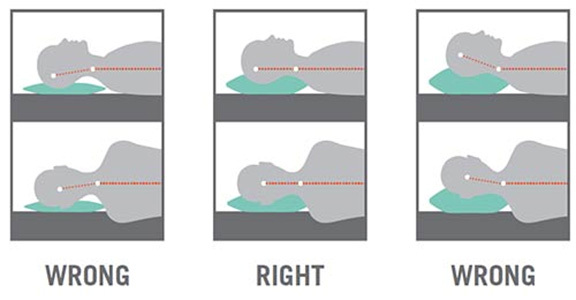 The head and neck should always be alignment in whatever position they are sleeping in (see figure below). In my experience, children and petite women tend to use average, adult-sized pillows that are too tall for their bodies; I recommend pediatric and smaller/travel pillow sizes for them. Patients who have chronic neck problems and straightened/reversed curves in their neck may benefit from using cervical support pillows. These are pillows that tend to be firmer that have a “bump” on either side to maintain a healthy alignment for the neck. People spend a third of their lives sleeping, so optimal sleep ergonomics are crucial. A bad or worn-out pillow or mattress may worsen or even cause your back problems. You may find that you are experiencing better quality of sleep and more energy just by improving how you’re sleeping and what you’re sleeping on. If you have been experiencing back aches when waking up, or if you have any symptoms that continue after you’ve made improvements, be sure to have your spine checked by a Doctor of Chiropractic! Sweet dreams!